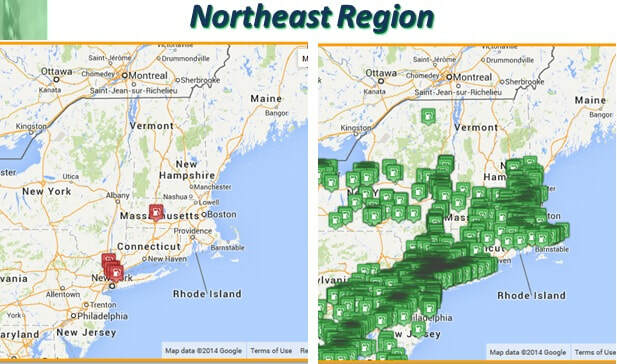 Want To Quickly Find Fuel, Food and Shelter During Storms, Floods, and Power Outages? 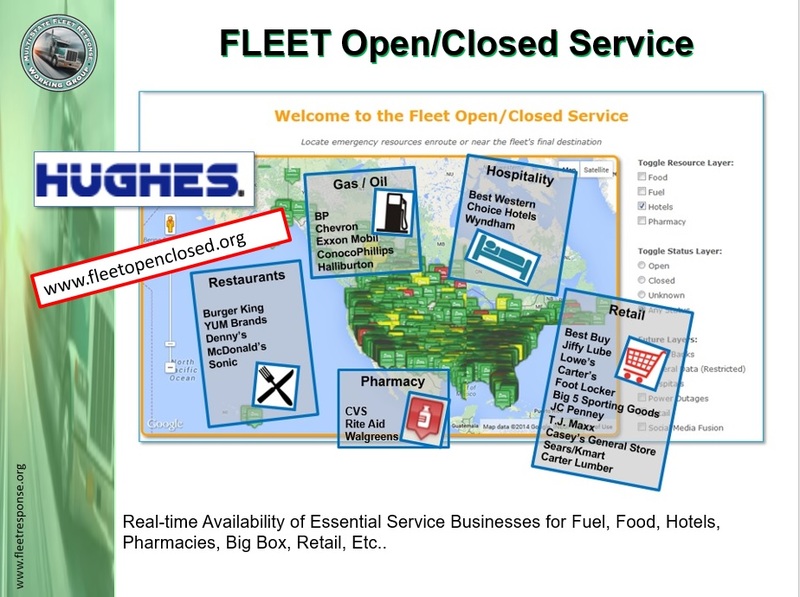 To 250,000+ Open Fuel, Food, Pharmacy & Hotel Locations Across The U.S.
what is the fleet open/closed SERVICE? 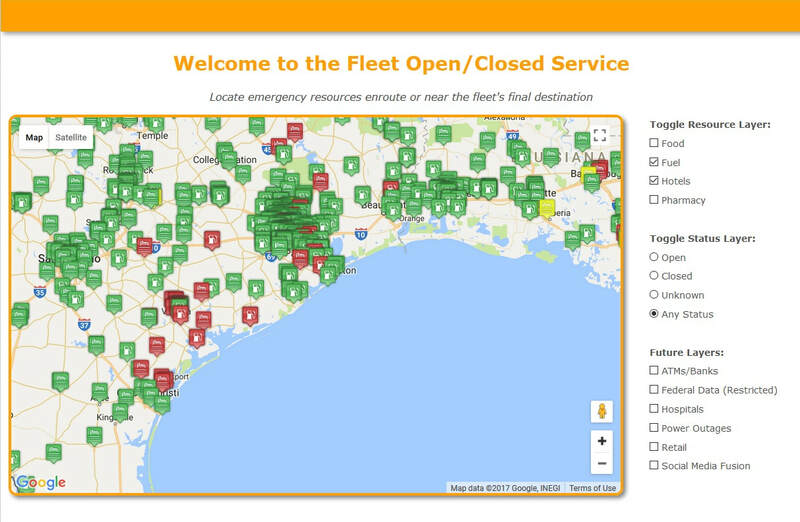 The FLEET OPEN/CLOSED Service is a revolutionary new online business app, developed by the Multi-State Fleet Response Working Group that leverages global satellite technology and helps operations professionals locate and be routed to open places of business that provide gasoline/diesel fuel, food/coffee, medications & medical supplies, retails stores and hotel rooms during a disaster or prolonged power outage within a city, county, state, region or across the United States. 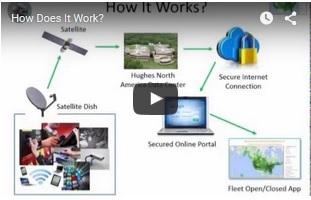 Hughes Network Systems (﻿www﻿.﻿hughes.com﻿) provides satellite and land line connections to millions of worldwide customer locations to support point of sale systems, satellite TV, internet access and data connections to electronic cash registers and security systems. Hughes has been providing these services for decades and manages their network connections from several operations centers around the world. The data that powers this app is provided out of their North American Operations Center in Maryland which is then fed to secure Amazon Cloud servers which feed the FLEET OPEN/CLOSED online app via the Internet. 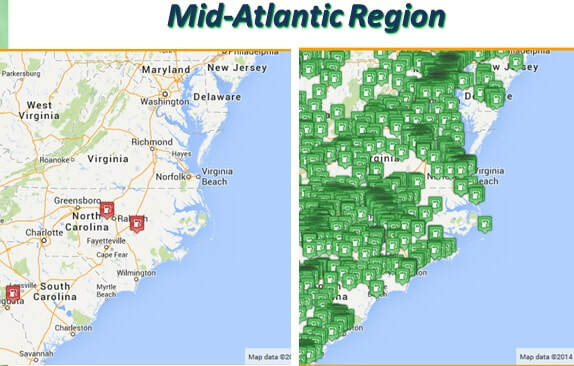 Created during SuperStorm SANDY in 2012, this services' data became a critical planning tool for thousands of businesses, the White House, federal government, the US Department of Defense, states and utility/delivery crews during first 2-3 days of the storm. Find Open Locations Quickly– Find open/closed fuel, food, pharmacies and hotel locations during power outages. Routing - Provides directions to the open facility so you don't waste time driving around trying to find it. Real-Time – The data in this service is updated hourly. This provides you the latest information in near real-time. National Coverage – The service covers every state in the United States. This can serve national organizations as well as local organizations for their needs. Commercial Use Only – This information is not open to the general public. It is reserved for commercial use only. This will ensure the system does not get bogged down with non-operational users. Proven - this app has been in use since 2012 to support regional response efforts to snow/ice storms in 2013 & 2014, flooding & tornadoes in mid-west in 2014, and the recent snow/ice storms in early 2015. Formally launched as nationwide online app for businesses in January 2015. Cost Effective - Based on industry feedback over the past 2 years, depending on size and cost per hour of your fleet/staff deployments, the operational cost savings of this service can be justified in 1-3 uses per year. This does not take into considerations risk reductions, public relations, and overall customer service impacts caused by delays in finding critical resources during response efforts. Thousands of Locations – Over 250,000 locations nationwide are covered at present by this service. 24×7 Access – The service will be available 24 hours per day. This will ensure availability anytime a storm or power outage occurs anywhere across the United States. Easy to Use – Navigating this site is simply using a point and click approach. Users can then zoom in on a particular region, state, city or individual location based on their needs. Smart Phone Friendly – Use your smart phone browser to view the Open/Closed App. Secure – This information is protected through a secure application process. The data is encrypted and access to this page is restricted to Working Group users only. Under Development - New capabilities are being developed that include more locations, ATM machines, onsite inventory of fuel, medicines, water, etc.. Help Desk Liaison Services for Businesses, and Smartphone app for mobile. Reliable - base on live data connections in real time instead of social media chatter that many times results in false alerts and rumors that waste precious time and fuel. This service is intended for “operational use” for private sector companies and state/local government agencies. who has used this SERVICE? "This service provides us a capability which allows us to more efficiently deploy are essential personnel crews during disasters by driving around a foreign area looking for open gas stations and hotels"
"During floods and storms that cause power extended power outages, this unique real-time service provides our County Executive and senior leadership with the ability to better inform the public and county first responders on where they can purchase gas, coffee, food, water, medicine, medical supplies and hotel rooms." “This service helps us efficiently deploy our essential personnel teams into disaster areas where power is out. This allows us to quickly locate open fuel, food and hotels for them without have them waste valuable time driving around a town they are not familiar with trying to find these needed services." what IS A recent use case? EVENT: Snow / Ice Storms Across Central, Northeast and New England States. PROBLEM: Inbound, out of region utilities, essential personnel, and supply chain companies don't know where to go to buy fuel, food and other critical services when working in a different state or an unknown environment. They need to be able to locate and be routed to stores quickly that are open and near their present location. They need reliable information to make these decisions that is not based on rumor, tweets and social media sources that many times are wrong. APPLICATION: The Open/Closed Service provides accurate store locations and status information based on data links to onsite POS (Point of Sale) systems and internet connects. Updated hourly, this service provided companies with information on where the fuel/food/retail/pharmacy stores and hotels were open and/or closed so their people didn't need to waste time and fuel driving around.